Christmas markets have their roots in European history, but have also become incredibly popular in cities and towns across the U.S. Exploring these markets is a fun way to celebrate the season and stock up on holiday gifts and goodies without even having to travel abroad. Families, couples, and groups of friends can all enjoy the sights, sounds, and smells of Christmas at these markets that are full of ornaments, Christmas trees, and warm winter wear. You can often find delicious gingersnaps, roasted chestnuts, mulled wine, and hot chocolate to entice your taste buds and keep you warm. So this holiday season, unless you’re traveling to one of the famous Christmas Markets in Europe, consider visiting one of these festive markets to get in the spirit of the Christmas. These cities also make excellent travel destinations in November and December to see how other cities celebrate the season. 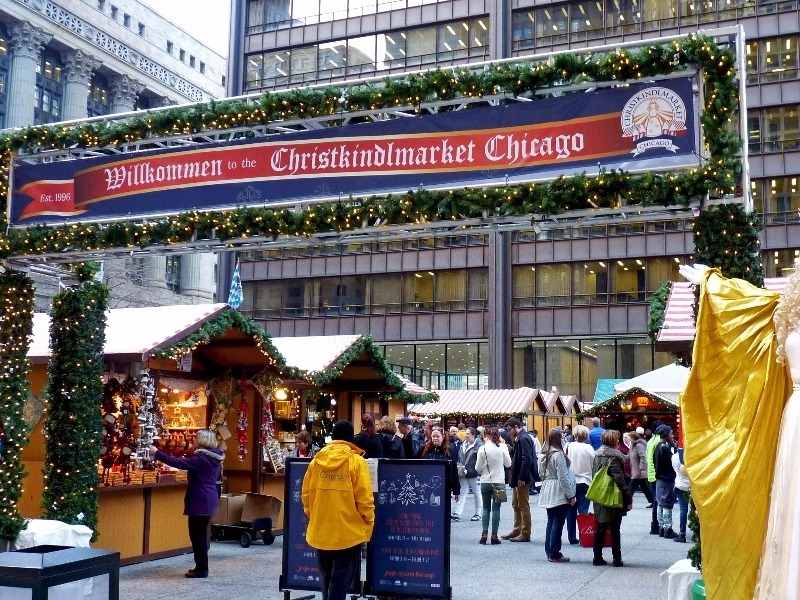 Sausages are one of the top reasons that Chicago’s Christkindlmarket is one of the top Christmas markets in the country, and it’s been one of the longest-running Christmas markets in the U.S. There are plenty of other amazing German-inspired foods here, and many vendors that sell cuckoo clocks, table laces, ornaments, and woodworking masterpieces. One of the essential activities at this market is to get a glass of gluehwein in a themed cup that changes designs every year. For the kids, there’s a Kinder Club that organizes fun activities, like scavenger hunts. Admission to the festivities is free. This is a unique Christmas market because it primarily celebrates the life and work of the great author, Charles Dickens. 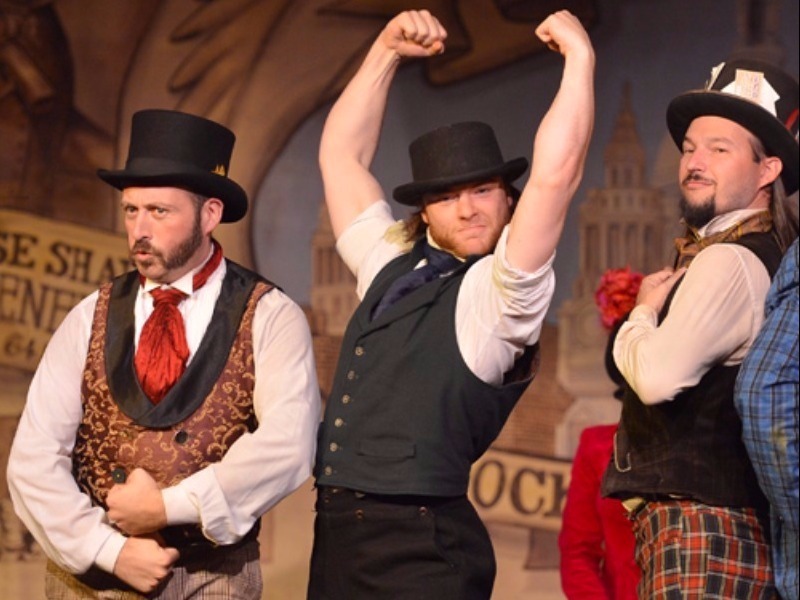 This fair will transform you back to London in Victorian times, as San Francisco takes on a whole new look. Expect to see lamp-lit lanes with pubs, shops, and restaurants that create Victorian London. Bring your top hat and dress in character because this is a festival to remember! Make sure to catch some of the theater performances and entertainment provided by local actors. This market is typically open for five weekends between Thanksgiving and Christmas. Shops onsite sell jewelry, masks, journals, drinkware, ceramics, and unique toys for kids. Visit the five traditional pubs for food and drinks, make your own crafts, and even get your fortune told! Leave it to a town named Bethlehem to throw an incredible Christmas market. 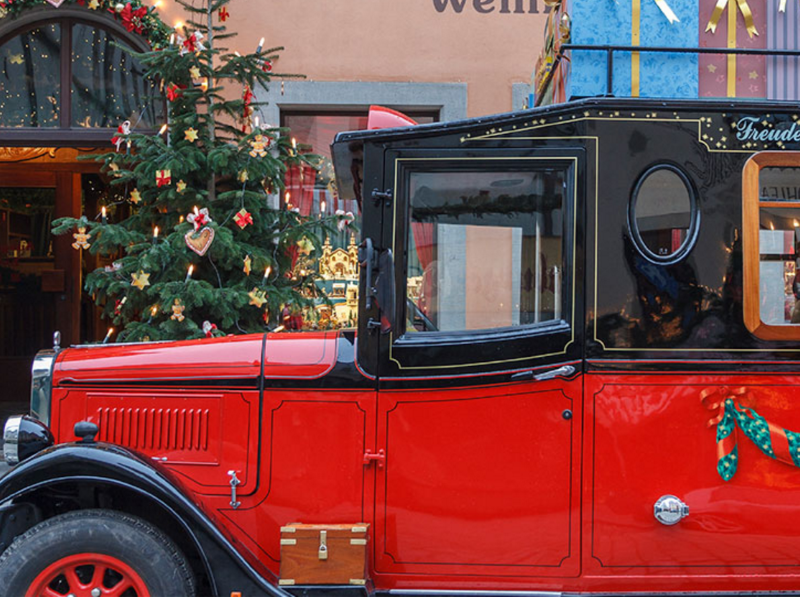 This is a classic Christmas market that embraces old world traditions and exudes authenticity. Here you’ll find glassblowers and other artisans creating holiday treasures for you to decorate your home or give as gifts. Favorite activities among families with kids include sitting on Santa’s lap and eating breakfast with Santa. This market runs on select days starting right after Thanksgiving. 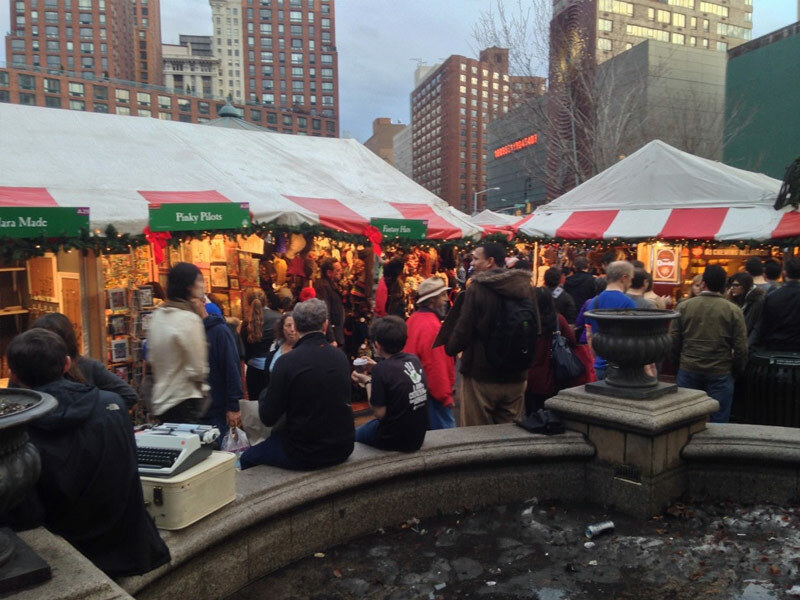 Christmas in New York City is a truly magical time, and aside from Rockefeller Square and Central Park, the place to be to celebrate is the Union Square Holiday Market. This market draws about a million people per year and typically has over 150 vendors set up. You can find unique handmade wearables and jewelry here, as well as children’s toys and Christmas ornaments under the red and white striped tents. You can find some excellent handcrafted bowls, winter accessories, artwork, and candles here. Lots of the artisans sell certified organic and fair-trade goods, as well as ones that are recycled and made in New York. You can find a list of the vendors on the Urban Space NYC website. Leavenworth is a German-themed town in Washington that has a wonderful Christmas market each year. 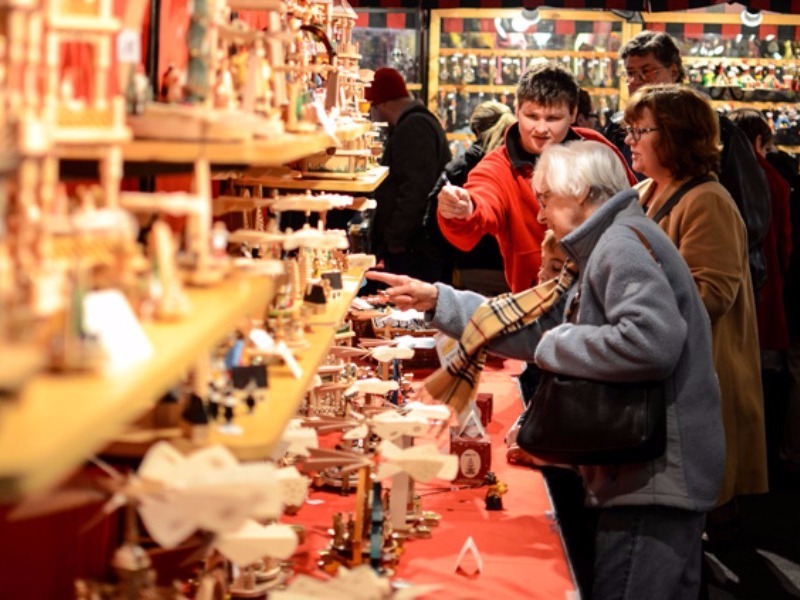 This Christkindlmarkt is typically held in Front Street Park and Leavenworth Festhalle. For over two decades, this Bavarian-style annual Christmas tradition has been helping locals and visitors get in the holiday spirit over Thanksgiving weekend. There’s a lantern parade after the welcome ceremony. 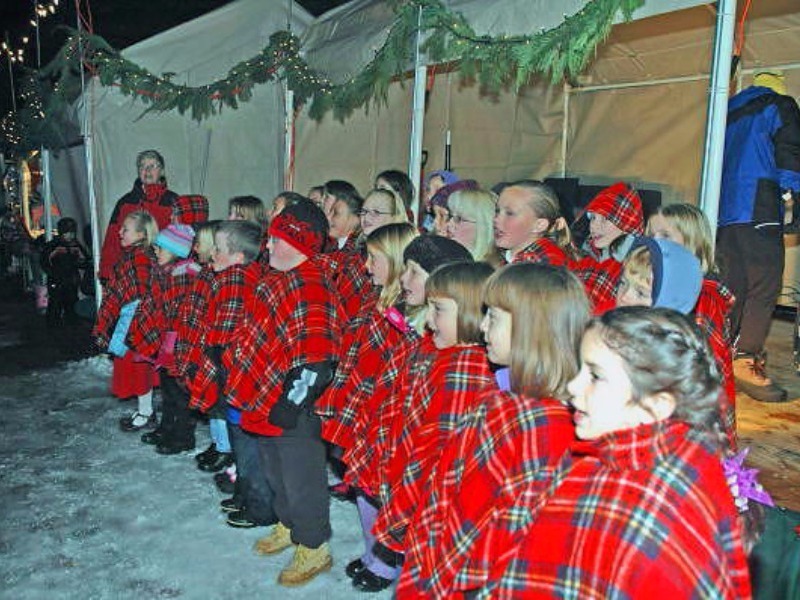 There’s lots of holiday music to enjoy here too, as well as a lantern-making workshop and children’s crafts at the Leavenworth Christkindlmarkt. The city of Arlington is the place to be if you love crafts and Christmas. 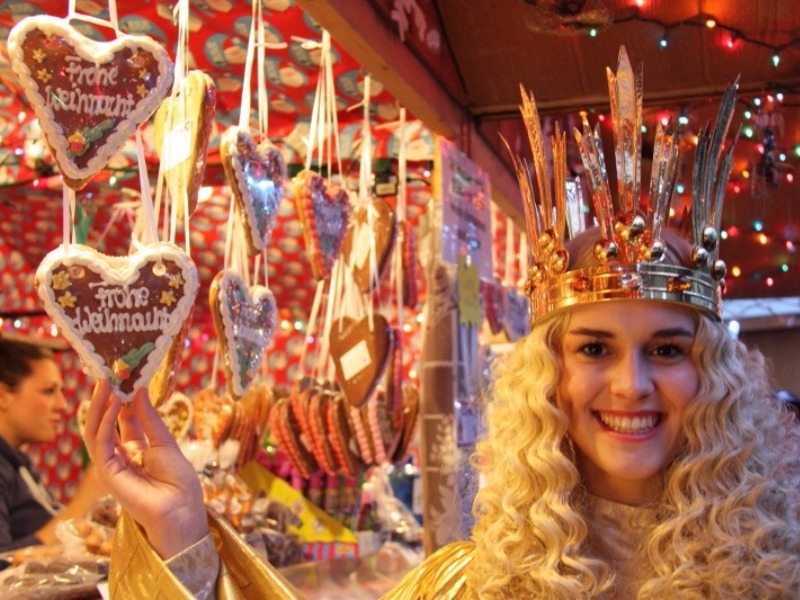 This Christkindl Market is one of the largest of its kind in the Southwest. The local Christkindl Market here is full of vendors that sell beautiful pieces of pottery, garments with alpaca wool, and Christmas decorations. There are lots of kid-themed activities here, including a puppet show petting zoo. The lantern parade is definitely worth watching too. 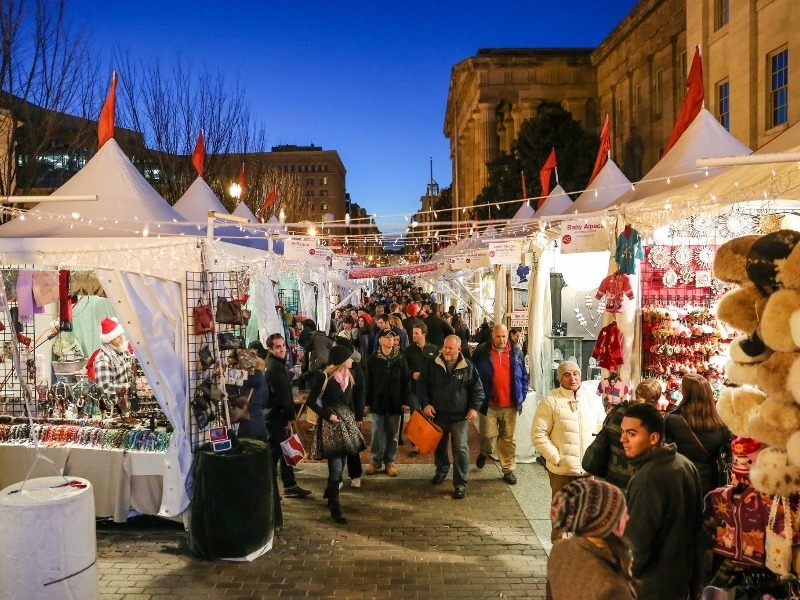 Credit: Downtown Holiday Market, Washington, D.C.
Another great place to celebrate Christmas is our nation’s capital, Washington, DC. This is a favorite Christmas market among foodies because of the fresh donuts, ice cream, and holiday treats for sale under festive tents. Non-traditional and ethnic foods, like churros and empanadas, can also be found here to savor and enjoy. You’ll find this market near the Smithsonian American Art Museum and the National Portrait Gallery, so it’s an easy walk from these popular sightseeing spots. The market is located at 8th and F Streets and open daily, and lots of musical acts across all genres perform at the Market Stage. One particularly fun place to bring in the Christmas season is Elkhart Lake, Wisconsin. 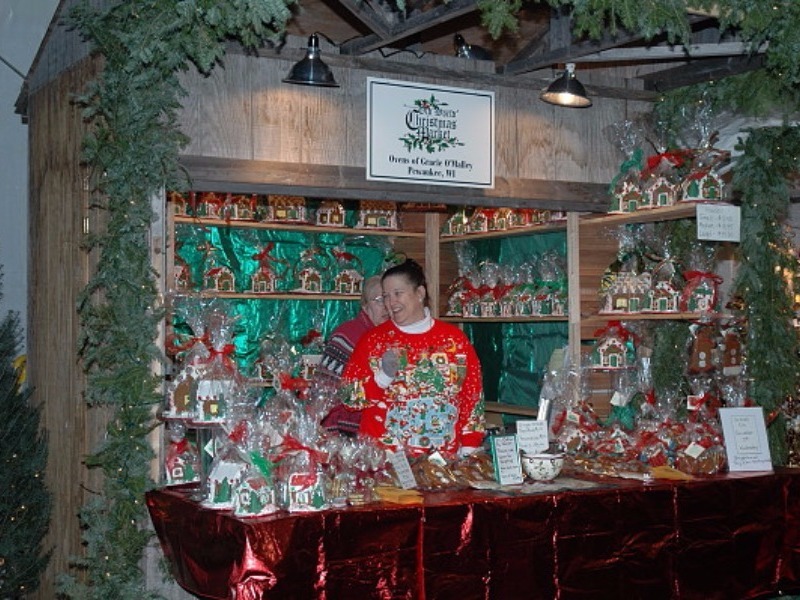 This market has traditionally been held at the Osthoff Resort and features a heated tent full of German crafts, apparel, nutcrackers, and gingerbread houses. You’ll also find gift ideas inspired by Russian and Czech traditions too. This market typically lasts for about 10 days in early December. Favorite foods to enjoy here include bratwursts, dumplings, potato pancakes, red cabbage, and apple strudels. It costs $6 for adults to attend the festival, but children under 14 are free when accompanied by a paying adult. Helen is a German-themed town in northern Georgia, so it only makes sense that there would be a Christkindlmarket here! This is a very walkable town, and the winters here are usually mild and pleasant. There are several German restaurants in town outside the festival, as well as fun shops that are open year-round. At all times of year, you’ll notice the German-themed architecture of the buildings in Helen and beautiful alpine scenery that you might not expect to find in Georgia. This market has free admission and is usually only open during the first and second weekends of December. 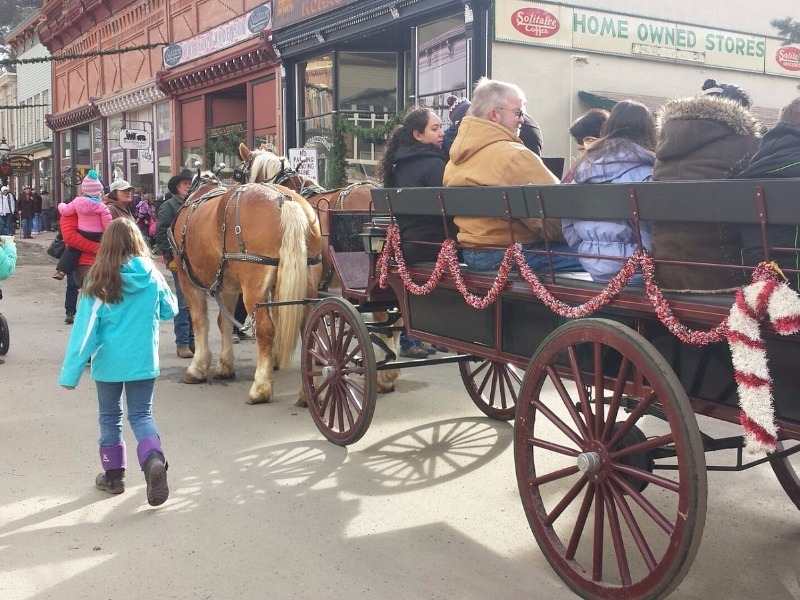 This Christmas market is a great place to find Victorian antiques and local Colorado wines. In fact, this is a great market for adults because there’s an annual pub crawl that lets you sample local wines and German specialties. Get in the spirit of Christmas by taking a horse-drawn carriage ride and listening to carolers sing festive tunes. This market typically takes place on the first two weekends of December. Don’t miss the chance to take a tour of the Hamill House and the Hotel de Paris Museums. The Santa Lucia Children’s Procession is extra special as well. There are dozens of vendors at Philadelphia’s Christmas Village, which sells lots of holiday gifts and delicious foods. Favorites foods of the festival include sausages and waffles. 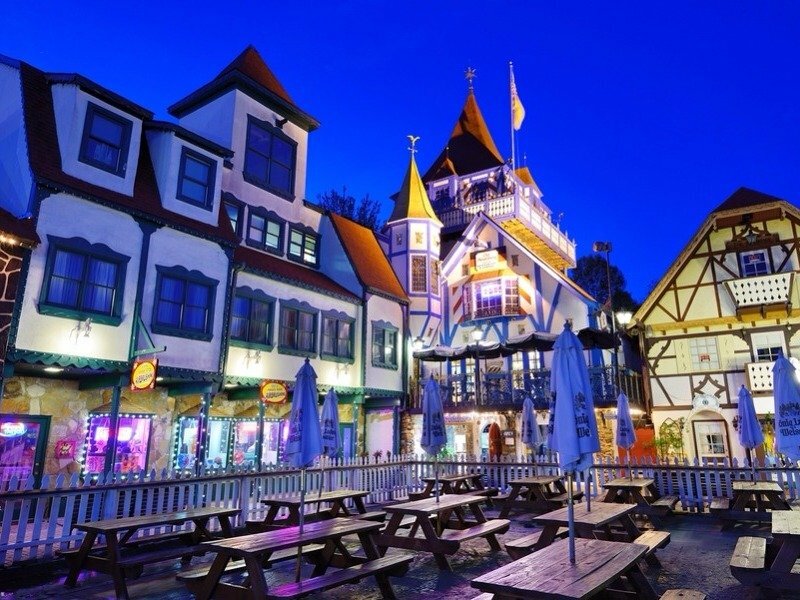 This market carries a very authentic German vibe and is also famous for its mulled wine. This market is located downtown at Love Park just west of City Hall. Admission to the market is free, and it’s typically open from 11am to 7pm Sundays through Thursdays and 11am to 8pm Fridays and Saturdays. It runs from Thanksgiving through Christmas Eve and often has a “sneak peek” weekend before the official opening to get visitors excited for what’s to come. 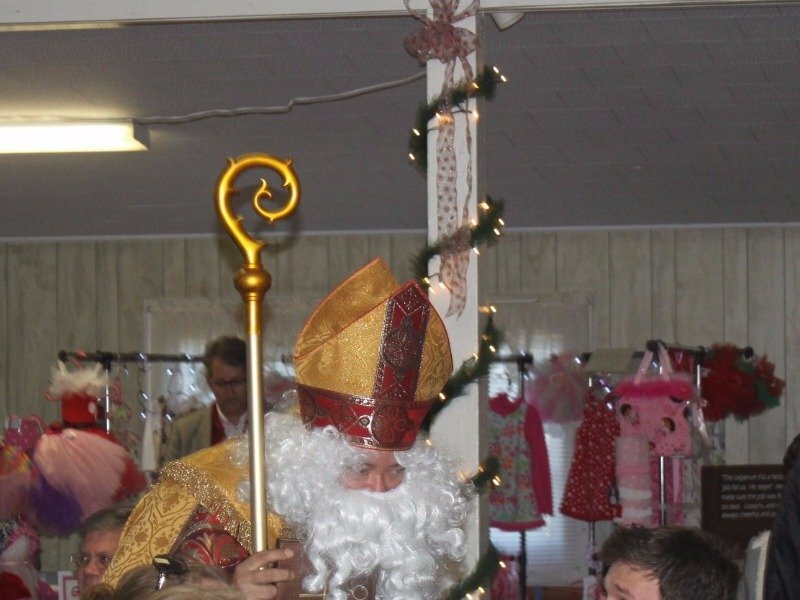 Lovettsville may be one of the lesser-known towns on this list, but it also has a fun Christkindlmarkt worth visiting. Lovettsville is preserved by the Loudoun Valley German Society and just two miles south of the Potomac River between Maryland and Virginia. It was a German settlement town for nearly 100 years. Here you’ll find the traditional German foods and drinks, as well as live music and activities for the kids.